ICAAP and ILAAP European guidelines. What is ICAAP? Internal Capital Adequacy Assessment. Internal Capital Adequacy Assessment Process (ICAAP) is an internal review requirement that evaluates capital adequacy, capital management and planning at banks with a specific focus on core risk factors. Expected to be reviewed at least quarterly at a board level and submitted annually to the regulator, the ICAAP analysis supplement risk management infrastructure by increasing board level self-awareness of risk exposures carried on the bank’s balance sheet. Originally introduced by the BIS Basel Framework as part of the Basel II Pillar II guidelines (supervisory review) ICAAP was adopted and in place before the 2008 crisis. However the depth of analysis and resources allocated to the ICAAP document were limited by the bandwidth of the risk team. It was only after the 2008 crisis that ICAAP implementation was fast tracked in many economies. What is ILAAP? Internal Liquidity Adequacy Assessment. 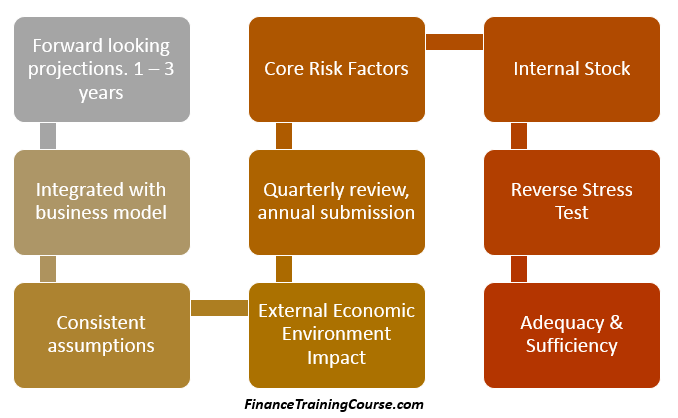 Internal Liquidity Adequacy Assessment Process or ILAAP is a similar process focused on liquidity risk, funding mismatch and management of both risks at a bank, using processes and frameworks similar to ICAAP. ILAAP to date is primarily a European standard sponsored by European Banking Authority (EBA) with implementation guidelines issued by a number of European Central Banks and Regulators. However its origins can be traced back to BIS guidelines on liquidity risk management issued in 2008. In terms of requirements it is essentially a revamped liquidity risk framework on steroids that brings in the lessons we have learned from ICAAP and puts them to work in a European setting. It uses liquidity risk tools in place at well managed banks prior to 2008 including maturity and liquidity gaps, High Quality Liquid Asset (HQLA) buffers, liquidity contingency funding (LCF) plans, LCR and NSFR reporting. The Dutch Central Bank (DNB) was one of the first Central Bank in Europe to roll out the new ILAAP requirements for banks regulated for business in Netherland in June 2011. The Prudential Regulatory Authority (PRA) under Bank of England and the European Bank Authority (EBA) issued guidelines in 2015 with planned implementations in October and June 2016 respectively. The suggested ILAAP guidelines essentially bring in Liquidity gap in terms of both contractual and behavioral trends, the Basel III Liquidity Coverage Ratio (LCR) and Net Stable Funding Ratio (NSFR) into a risk governance framework. 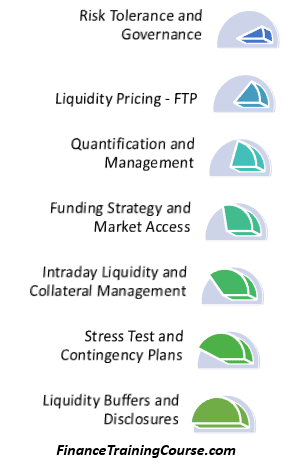 The framework highlights processes for setting, tracking and managing liquidity risk limits. It assigns responsibility for reporting and monitoring liquidity limits and liquidity buffers and stress tests key liquidity metrics using both conventional and reverse stress tests. Similar to the capital adequacy assessment, a liquidity assessment is performed keeping in view planned growth and balance sheet expansion as well as the impact of economic factors and drivers. The ILAAP guidelines now also require the implementation of a pricing mechanism for inter bank and inter group liquidity (FTP – Funds Transfer Pricing), Collateral management (netting and settlement), liquidity contingency plans and public disclosures on the state of liquidity at the bank. The common framework in use with both guidelines (ICAAP and ILAAP) is the risk governance framework that requires that management analysis is produced based on a policy document approved by the board with the requisite process and policy guidelines. This implies assignment of the role to a senior team at the bank with a direct reporting line to the board; identification of core risk components and risk types; limitations and prescriptions on model usage, frequency of reporting, exception processing and escalation. It also specifies the audience that must be given to such a presentation and the prescribed actions on recommendations made by the periodic report. And the sharing of this commentary and analysis with the regulator. European Banking Authority EBA – Consultative Document on ICAAP and ILAAP. The EBA consultative paper on ICAAP and ILAAP implementation guidelines was issued and circulated in December 2015 with a suggested implementation deadline of 30th June 2016. The consultative document highlights a number of key requirements. ICAAP and ILAAP external reporting to the regulator (possibly public disclosure) is limited to an annual submission but quarterly internal reviews and presentation to management and board are recommended. All risk reviewed that may have material impact on capital and liquidity. Review of risks, available stock and access to capital and liquidity on demand. To be linked with internal planning, modeling, assessment and review processes with active participation from business. Not a standalone or isolated exercise to be conducted by firm wide risk in a room. Need to ensure that internal as well as external drivers and environment impact is modeled and included in the analysis. Quality, availability and source of internal Capital and Liquidity over quantity. Testing converitability into cash using market based and market driven assumptions for instance testing High Quality Liquid Assets (HQLA) buffers with trade weighted liquidity analysis. Assumptions consistent and in alignment with internal business plans and models. Assumption should be reviewed, disclosed and signed on by all stakeholders. Requirement to present both Net (of risk and diversification benefit) and Gross figures in the analysis. Board advised to consider scenarios and capital plans under zero correlation and perfect correlation (zero diversification benefit) between risk types. The perfect correlation stress test (when things go wrong, they will go wrong together; even risks that historically tend to diverge, will converge) or the market will collectively move to hit as many stop losses as possible is the original Nassim Taleb stress test recommended in 1997. It has finally found it’s way into a regulatory document. Severe stress tests and reverse stress testing including shortfall probability for both capital and liquidity. A reverse stress test identifies an end state such as insufficient capital, a run on the bank, a liquidity squeeze and then calculates the probability of the move (in the underlying metric) required to make that end state occur. Reverse stress testing is one of the key revisions in the Basel III framework and like the original introduction of Value at Risk is going to take some time to sink in. Take a look at the three short references that follow to get a sense of why that will be the case. Once a year review of scenarios used in the stress test and both ICAAP and ILAAP analysis. ILAAP – EBA Liquidity Risk Self Assessment for banks. European Bank Authority (EBA) has also circulated a Liquidity Risk Self Assessment Questionnaire that asks banks to evaluate themselves in terms of compliance with the following core areas. Compliance is graded between Fully, Mostly, Partially, No or Not Applicable, with a road map and commitment for compliance required in case any of the answers does not fall in the upper grades. Liquidity Risk – ILAAP – European Bank Authority (EBA) Self Assessment for banks. The Dutch Central Bank (DNB) implemented ILAAP guidelines in June 2011. The Double Effect white paper on the implementation is a great source of information on the core components of that implementation and its benefits to the Dutch economy. Also check the original DNB supervisory review guide on ILAAP. PRA Liquidity Stress Test for ILAAP. The PRA Supervisory statement on ILAAP issued in mid 2015 with an implementation deadline for October 2016, suggests a number of drivers for the liquidity stress test that need to be included in the analysis. a) The run-off of retail funding. This includes an assessment of the likely run-off of different components of the retail book, taking into account common features such as guarantee cover, maturity, interest rate sensitivity, customer type, product type, deposit size, or the channel through which the deposits were affected. (b) The reduction of secured and unsecured wholesale funding. An assessment of the type and geographical location of the counterparty, the level of creditor seniority, the nature of the relationship the firm has with the counterparty, the type of underlying collateral (if applicable), and the speed of outflow. The risk of shortening tenors should also be assessed. (c) The correlation and concentration of funding. An assessment that takes into account instrument type, markets, currency, liability term structure, counterparty and market access, as appropriate. Effectiveness of its diversification strategy? (d) Additional contingent off-balance sheet exposures. An assessment of derivative cash flows caused by maturity, exercise, repricing, margin calls, a change in the value of posted collateral, collateral substitution, sleeper collateral, and volatile market conditions. Should also consider funding commitments (facilities, undrawn loans and mortgages, overdrafts and credit cards), guarantees and trade finance contracts, as well as facilities to support securitisation vehicles, including sponsored and third-party structures. (e) Funding tenors. Vulnerabilities within the term structure due to external, internal or contractual events (where the funding provider has call options). (f) The impact of a deterioration in the firm’s credit rating. Contractual and behavioral outflows resulting from credit downgrades of varying magnitude, the types of collateral which may be required and the speed of outflow where appropriate. (g) Foreign exchange convertibility and access to foreign exchange markets. Stressed outflows by individual currency and tenor where appropriate. This information must support an assessment of how shortfalls can be funded in a stressed market with impaired access to foreign exchange markets and loss of convertibility. (h) The ability to transfer liquidity across entities, sectors and countries. Assess the intragroup support assumed available in stress, or the impact of a failure of a group entity to repay loans in a timely manner, where appropriate. This assessment should include considering existing legal, regulatory and operational limitations to potential transfers of liquidity and unencumbered assets amongst entities, business lines, countries and currencies. (i) Estimates of future balance sheet growth. This should include considering how planned or forecast balance sheets may behave in stress and whether the firm’s risk appetite would be breached. (j) The impact on a firm’s reputation or franchise. Firms should include an assessment of implicit liquidity requirements arising from a need to fulfill expectations to acquire assets, rollover or buy back assets, to extend or maintain other forms of liquidity support, or to permit premature termination of retail term or notice liabilities. Also see ILAAP, ALM, LCR report validator.